Eat with Style in the upcoming Folk Market 2015! Presented by the students of STP Nusa Dua Bali. Shop for your favorite meal and take pictures with the cool VW food trucks and food booths. Get involved in the activities and enjoy entertaining live performances. 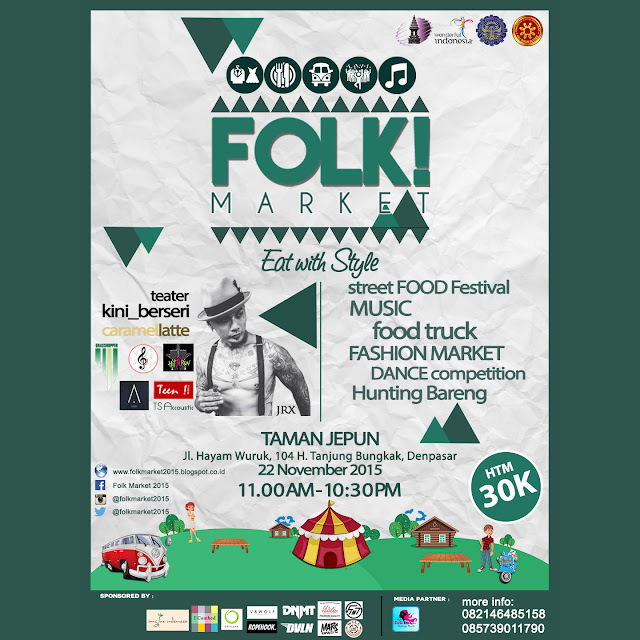 Visit @folkmarket2015 for event details and other information. 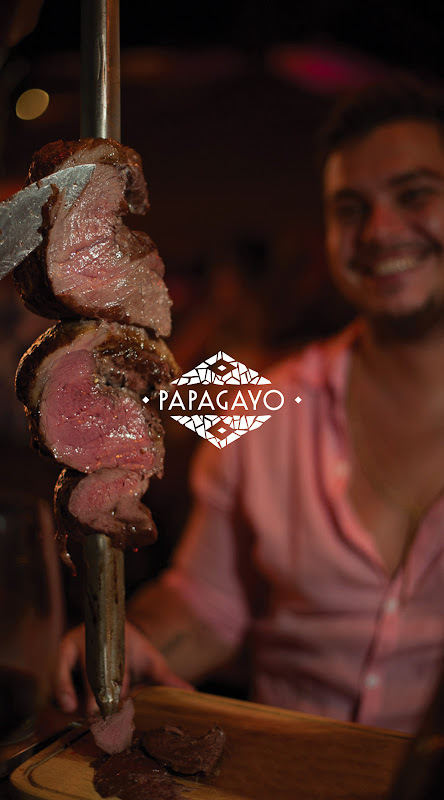 Papagayo is a Churrascaria, or restaurant specializing in Churrasco, a traditional Brazilian barbecue. Born from the love of our Brazilian heritage, for you meat lovers in Bali. Our meats are marinated perfectly aged meats in our signature mix of herbs and spices grilled to perfection over hot coals for that mouthwatering smokey flavour, just like the Gauchos (cowboys) used to do it. This sizzling dish, stacked over one meter long sword-like skewer, is then carved directly at your table by one of our Passadores, the meat carvers. A truly unique dining experience. Gather with like-minded food lovers in the elegant ambiance of Petani Restaurant for an Evening of Exotic Flavours with William Wongso. 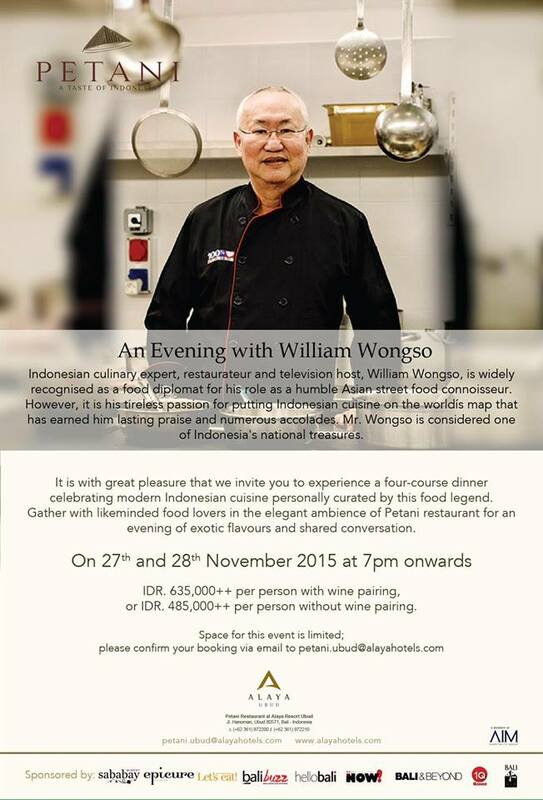 Humble and friendly, William Wongso is the authoritative figure in Indonesian culinary world. Widely known as a TV figure, to fellow foodies he's also well known for his relentless passion in promoting Indonesian cuisine all around the globe. Many of Indonesian presidents and authorities trust his cold hand in preparing dinner welcoming guests from foreign countries, Indonesian banquettes aboard, and he's also the face that represent Indonesian cuisine in the new documentary made by the Culinary Institute of America (CIA). Constantly traveling throughout Indonesia to uncover its rich culinary heritage, there's no doubt that William Wongso is a walking encyclopedia of Indonesian cuisine. Taking a break from his journeys, it is with great pleasure that this 27th, and 28th November, Petani Restaurant at Alaya Resort Ubud invites you to experience a four-course dinner celebrating modern Indonesian cuisine with this Indonesian food legend. During the evening, diners will be treated to a scrumptious four-course dinner to celebrate modern Indonesian cuisine.